If you've been in a car accident, you're at risk for developing post-traumatic stress disorder (PTSD). Research shows that about 9 percent of the general population who are in car accidents develop PTSD. That number is significantly higher for people who have been in a car accident and seek mental health treatment, with an average of 60 percent diagnosed with PTSD. Each year around 3 million people are injured in motor vehicle accidents (MVAs). While car accidents are quite common, it's important to point out that not everyone who experiences an MVA develops PTSD. A number of studies are trying to identify risk factors for developing PTSD after a car accident. Studies of MVA survivors paint a similar picture in some regards. Interestingly, studies have not found much support for the influence of specific characteristics of the car accident, for example, how severe it was or whether the driver or passenger was injured, on the development of PTSD. Instead, there is more support for how one responded to or perceived the accident. For example, one study found that the perception that your life was in danger was the strongest predictor for PTSD six months after the trauma. Another study found avoidance behaviors, the suppression of thoughts about the car accident, rumination about the trauma, and dissociation were most strongly connected with PTSD symptoms two to six months after an accident. A strong perception that your life was in danger during an MVA can lead to avoidance behaviors (for example, not getting in a car or going on the highway), which in turn can increase the likelihood of PTSD. Such avoidance strengthens the belief that driving is dangerous, a thought pattern that can maintain your fear response. The avoidance of thoughts and emotions can interfere with the healthy processing of your emotions, which can also increase the risk of PTSD. Feelings of anxiety and increased heart rate when you're faced with reminders of the event. Hearing a horn honk or brakes screeching may automatically activate a fear response. Feeling a little more on edge when you're driving. You may be jumpy or startle more easily in a car. Being more watchful. You're more likely to scan your environment for potential sources of threats (for example, people driving too fast). Avoidance. Because of the anxiety that often follows an MVA, it's natural that you may want to avoid some situations or experience hesitation at times, such as driving on the highway. Any or all of these symptoms may occur which are part of your body's natural response to a traumatic life event. They're designed to keep you aware of potential dangers in your environment and prevent you from experiencing a similar event again. These symptoms should naturally subside over time, but keep an eye on them. If you notice they're getting more severe and/or more frequent, if you're avoiding more situations or the symptoms are beginning to interfere with your life, then you may be at risk for developing PTSD. If that happens, please seek some help. There are a number of effective treatments for PTSD. One approach that may be helpful is exposure therapy. Other options are available as well, including cognitive therapy, behavior therapy, and medications. By taking steps early to address your anxiety, you can overcome the effects of a motor vehicle accident. Berna G, Vaiva G, Ducrocq F, Duhem S, Nandrino JL. Categorical and Dimensional Study of the Predictive Factors of the Development of a Psychotrauma in Victims of Car Accidents Journal of Anxiety Disorders. January 2012;26(1):239-45. doi:10.1016/j.janxdis.2011.11.011. Ehring T, Ehlers A, Glucksman E. Do Cognitive Models Help in Predicting the Severity of Posttraumatic Stress Disorder, Phobia, and Depression After Motor Vehicle Accidents? A Prospective Longitudinal Study. Journal of Consulting and Clinical Psychology. 2008;76(2):219-230. doi:10.1037/0022-006X.76.2.219. U.S. Department of Veterans Affairs. 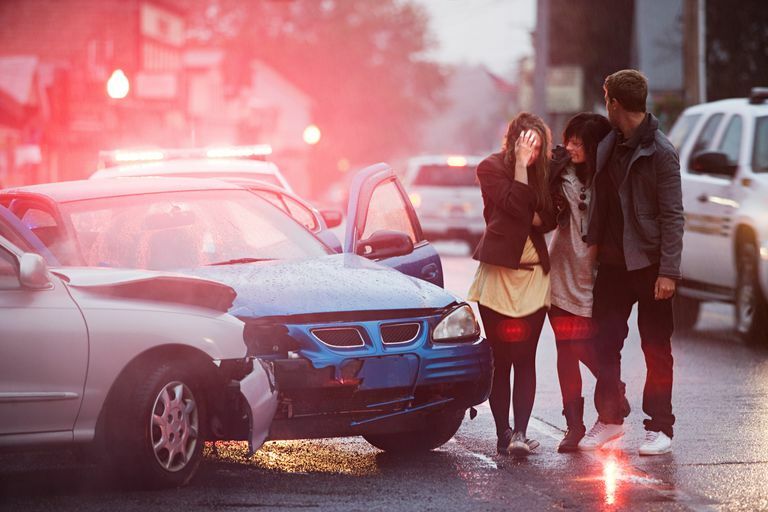 Traumatic Stress and Motor Vehicle Accidents. National Center for PTSD. Updated February 23, 2016.